It’s the beginning of a new semester, which means that you have a whole new schedule of classes and a new set of syllabi/syllabuses/whatever. 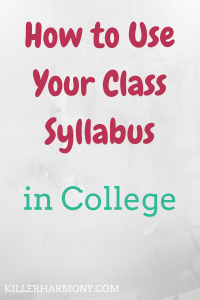 Your syllabus is one of the most important handouts you will ever receive for a class. You need to make sure you keep it, and that you use your syllabus. Throughout my four+ years in college, I have learned how to use your syllabus to help you succeed and get the best grades you can in a class. Obviously, using your syllabus is no guarantee of good grades, but it is still a great resource. Here are my tips for using your syllabus. 1. Pay Attention that First Day. The first week of classes is sometimes referred to as “syllabus week,” because that is when professors go over the syllabus. Each professor is different, and they might take only a few minutes on it, or they might take a whole class or two. However long they take, pay attention to what the professor says about the syllabus. Yes, you do have a copy of the syllabus for your records, but there might be things that your professor left out. Class schedules can change, or your professor might have forgotten about a conflict they had. Be sure to make note of any missing information such as test dates, days your professor might be gone or any wrong dates listed in the syllabus. Sometimes professors forget to update the dates from semester to semester, and they might only make those announcements that first day. 2. Read the Syllabus On Your Own. More likely than not, your professor is not going to go through the syllabus word for word. You’re in college, and you are more than capable of reading it on your own. Figure out what information your professor gives you about their contact information, office hours and test dates. Familiarize yourself with the attendance policy. There’s this myth that professors don’t care if you show up to class. In my experience, professors care. Attendance is almost always part of my grade, even if it is a small part. Those attendance points are easy points that you don’t want to miss. Also, be sure you know what constitutes an excused or unexcused absence so that you can plan for days that you might have to miss class. 3. Write Down Important Dates. Get out your planner and write in any test dates, project due dates and other important dates you need to know. Yes, your syllabus is important to keep on hand, but having information for all of your classes in one place makes things really easy. Writing things down also help solidify them in your mind. Once you have gone through and written out all the important dates related to your class, it will be easier to remember when you have something due. Also, if you are involved in activities, like sports or the arts, that might require you to miss class, this is super important. Once you know your schedule for those activities, make sure you alert your professors to the absence so that they can help you make up any missed work. 4. Put Your Syllabus in a Safe Place & Get Organized. Your syllabus is an important piece of paper that you need to keep safe. It has almost everything you need to know about the class right there in one document. One of the things that is in that document might even help you get organized for the class. If your professor happens to have a requirement for a specific binder or notebook, you can start using that specified method immediately. If your class is going to primarily be a lecture, you can stick to a notebook with maybe a separate folder. For a class that has a lot of handouts, you might want to use a binder or a couple of different folders. Using your syllabus to get organized is a great way to make sure that you are setting yourself up for success. Not every class will require the same organization method, and your syllabus will usually tell you just what you need to organize your notes and information for each class. 5. Look at Your Syllabus Regularly. Throughout the rest of the semester, make sure you look at your syllabus. Even if you followed my previous tip and added all of the assignment dates to your planner, you might have let something slip by. Some classes will even add specific assignment requirements to the syllabus. That way, professors can avoid repeating themselves all the time. I had a class where the syllabus had some basic information about the term paper we had to write. You never know what might be in there. That is how I like to use my syllabus to help me succeed in my college classes. I love being able to have a document that describes the class in depth and can give me answers to quick questions. Your syllabus is the most important document, and I cannot stress that enough. Using (or losing) your syllabus can make or break your grades, so you need to make sure you do what you can to stay on top of your assignments. What do you do with your syllabus after you get it? Do you actually read the thing? Let me know in the comments! Also, be sure to read this post about preparing for the spring semester and follow me on Twitter (@HannahHaefele) so you don’t miss future posts!